We stand true to this mission by always being there for our customers first-hand when it comes to providing customized service and also when providing convenience services. And that means being realistic and adapting to today's fast-paced environment. After all, you don't last over 120 years without being adaptable for your customers. We understand that you might not always have time to make that extra trip to the bank. That's why we try to bring Blue Ridge Bank to you — quickly, easily, and more relaxed than most other banks. Of course, we're very serious about our customers' financial goals, but managing your money doesn't have to be a drag or too complicated to understand. We want our valued customers to feel comfortable and confident in their financial decisions. It's your money after all, and the very purpose of Blue Ridge Bank is to guide and empower you toward your short- and long-term goals. Kasasa Cash® – Get a whole lot more from your checking without paying for it: free checking, plus high interest, and nationwide ATM fee refunds. Kasasa Saver® – Save automatically with an account that does the work for you. Free Kasasa Saver is linked to your equally-free Kasasa Cash checking account. Every month, the rewards earned in your checking are automatically transferred to Saver, so you can build your balance with ease! Customer-Focused Lending – At Blue Ridge Bank, your dreams are our focus. We get to know your unique situation, then customize lending that will work for you. Whether it's a new home, vehicle, business expenses, or anything in between, our customized lending is universal. Innovative Services – Technology moves quickly. And as a result, so do we. We offer our customers more convenience in the form of anytime accessibility to your accounts. Take advantage of our mobile banking, online banking & bill pay, and eStatement services — all for free! As long as we've served the community, we realize that it would never be possible without the dedicated support and longstanding commitment of Blue Ridge community members. From all of us at Blue Ridge Bank, we'd like to say thank you for the past 120 years and would like to reiterate our never-wavering commitment for the next 120! 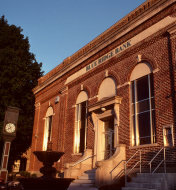 Blue Ridge Bank was chartered and organized in 1893 as a state institution under the title "Page Valley Bank of Virginia." The Bank officially opened for business on Monday, January 3, 1894 with paid in capital of $15,000 and a charter maximum of $25,000. At the time of its organization it was the only bank in Page County, Virginia. The first location was in a building that had been formerly occupied by the private bank of D F Kagey and Company. The building, located at the corner of Main and Bank Streets in Luray, still stands. In 1928, the Bank moved from its original location to its present location at 17 West Main Street in Luray, Virginia. The original building was erected at a cost of $60,000. The building has since been remodeled several times into what is now the Bank's main office. In 1897 the Safe Deposit Department was established. The Bank was converted from a state bank to a national bank and the name was changed to "The Page Valley National Bank of Luray" in April of 1902. The Savings Department was established in 1909, paying interest on savings deposits at the rate of 3.0%. The beginning of the Great Depression caused the failure of over 7,000 banks across the nation during 1930 through 1933. As a result, on March 6, 1933 President Roosevelt ordered that all banks be closed in order to prevent a run on the nation's money supply. People were in a panic and believed that their money was unsafe in their banks. Even on this day, The Page Valley National Bank remained open to its customers. A story that has been passed down is that Mr. Landrum, the President of the Bank at the time, refused to close. He drove to the Federal Reserve Bank of Richmond and brought back a substantial amount of cash to display in the vault. He believed that if the Bank's depositors could see their money, they would feel that it was indeed safe and business would proceed as usual. The Bank opened its first branch at 612 East Main Street, Luray, in June of 1974 to provide an additional location convenient to the new shopping center in East Luray. Our second branch in Shenandoah, Virginia, opened in March of 2002. A third branch in McGaheysville, Virginia opened in April of 2003. On October 15, 2011 the name was changed from The Page Valley Bank to Blue Ridge Bank. In November of 2011 we opened a fourth branch in Charlottesville, Virginia. On February 1, 2013 we consolidated our East Luray Branch into our main location. Our newest branch opened in Harrisonburg, Virginia in April 2014. Blue Ridge Bank is extremely proud of its more than a century of customer based service, and looks forward to serving its current and new customers for many years to come, with the attention and service that only a locally owned independent community bank can provide.